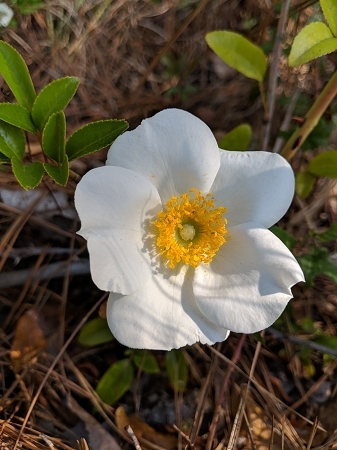 Cherokee Rose (rosa laevigata) - State flower of Georgia. Also sometimes called the camellia rose or snow white rose. Chinese rose introduced to the US in the 1780's. According to legend this rose sprung up out of the ground as a result of tears falling from a Cherokee mother over the deaths of her children during the infamous Trail of Tears march where the Cherokee were forced from their land in Georgia and relocated to Oklahoma in 1838. The yellow center of the rose is said to represent the gold that was stolen from the Tribe and the seven petals of the flowers to represent the seven clans of the Cherokee nation. It can be found growing in the wild throughout the southern states along the trail of tears from Georgia to Oklahoma. Large and aggressive climber is very thorny, stays evergreen throughout the winter and can grow to 20' tall and 10' wide. Best planted for naturalization or as a hedge. Large and fragrant snow white flowers with bright yellow centers appear in Spring and are followed by large red rose hips which birds and other wildlife feed on. (rose hips are not suitable for human consumption due to the small hairs on them which can irritate the stomach). Beautiful plant with a colorful history, not fussy about soil conditions, but needs plenty of room to grow. Perennial Zones 7A - 10. Live plant in 3 inch container.